Ahead of the roll-out of the EU Digital Single Market strategy in May, the European Commission published last week the Digital Economy and Society Index (DESI). The UK is amongst the top digital performers ranking 6 out of the EU28 behind Denmark, Sweden, the Netherlands, Finland and Belgium. 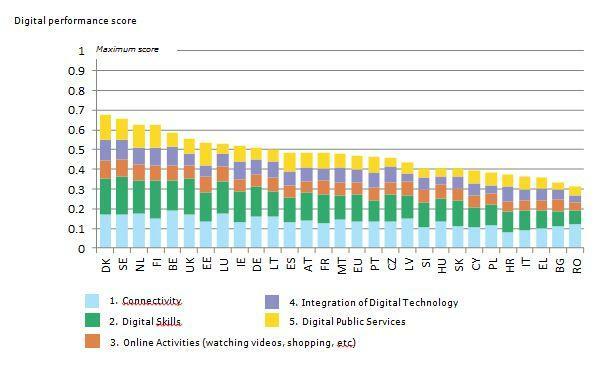 Lowest digital performers include Italy, Greece, Bulgaria and Romania. To determine a country’s “digital readiness?? ?, the Commission considered 4 key indicators including human capital (connectivity and digital skills), integration of digital technology, online activities and digital public services. The Index reports on data collected in 2013 and 2014. Compared with 93% in Luxembourg and 48% in Romania, 89% of the UK population (aged 16-74) are internet users, which is higher than the EU average of 75%. UK internet users are also more digitally skilled than previous years (59% in 2012 and 73% in 2014). The authors of the report note however that the UK is lacking skilled ICT professionals. Regarding online activities, the DESI indicates that 85% of UK internet users are online shoppers (highest score in the EU28), but they are less eager to use the Internet for video calls, or for playing and downloading games, images, films or music. The UK is leading the pack with the cheapest basic fixed broadband connection. Subscriptions to fast (minimum of 30 Mbit/s) broadband connections have increased significantly, although the UK only ranks 14 out of 28 (Belgium is at the top spot with 73% of fixed broadband subscriptions being superfast). Ofcom data published this week shows that 32% of UK broadband connections are now superfast (30Mbit/s and above). Although the average UK broadband speed is of 22.80Mbit/s, the speeds are typically slower in rural areas. As the BSG found in recent reports, UK businesses, and in particular SMEs are not taking advantage of the digital technologies according to the EU Index; E-commerce is not widespread as only 19% of SMEs sell online and 8.3% sell across borders. The UK ranks second to last for the proportion of businesses using electronic information sharing and RFID. On a more positive note, the report indicates that the UK has made significant progress towards the digitalisation of public services, moving from the 16th place in 2013 to the 11th in 2014. There are wide disparities in the EU though, for example, E-prescriptions are widely used by GPs in Estonia (100%) while in Malta this service in non-existent. Whilst the upcoming Digital Single Market policies are likely to impact on the UK digital economy, more could be done at national level for the UK to claim its place as main digital leader. As outlined in the House of Lords Digital Committee report “Make or Break: the UK’s Digital Future?? ?, the UK is at risk of being left behind unless the Government takes a more ambitious approach in the development of digital policies the House of Lords Committee recommends that the UK invests in its infrastructure, raise awareness of the value of technologies, encourage broadband take-up and innovation and create the right environment for SMEs. The BSG will be involved in this debate and will examine the impacts of the EU Digital Single Market policies on the UK broadband economy.